Sri Lanka has opted to enter the global economic system with a very poor appreciation of the scientific considerations of the different options and paths available. In the global financial system, growth is seen as engine of development, but the source of power that has been chosen to propel that growth is making this nation dangerously vulnerable to the emerging global reality of Climate Change. Power, as is used in the present context, is energy in a state utilizable for our uses. It is inexorably tied to the economy of any nation. However, power should be categorized into two distinct groups: Internalized power or power that can be generated locally within the boundaries of a given nation and externalized power or power that has to be obtained from outside the nation and has to be imported. If the rate of growth is constrained by internalized power, it will produce excellent effects vis-à-vis inflationary trends in the economy. Conversely, if growth is dependant on externalized power, the economic system becomes hopelessly locked into whatever inflationary cycle that the external suppliers are prone to, and any internal attempts in controlling it are useless. Given the exponential rise in the environmental and social cost of fossil energy, the wisdom of attempting to develop based on the consumption of externalized fossil power is questionable. The promotion of the current perverted vision of ‘development’ where massive projects, consuming huge quantities of cement (sixteen times more potent than gasoline in producing fossil carbon dioxide), steel where every ton of is responsible for 1.2 tons of CO2 form the basis of this ‘development’ must be questioned. It is such uninformed ideas of development, of unplanned construction and undervalued human health that seek the creation urban centers carrying a massive fossil carbon footprint. Growth for the sake of growth without directing it towards a nationally accepted plan reeks of self-interest. An example is the promotion of a megapolis without considering the Carbon cost of the air conditioning and coolants needed for such a megapolis. This jump in our Carbon footprint makes us irresponsible in terms of our international obligations to address Climate Change. As an island state we have not been responsible by the sea around us either. Sri Lanka is exposed as the worst polluter of the Indian Ocean. The new maps on human impact on the world’s oceans are now on the web. Although there had been regular commentary on the need of every government and various authorities to be cognizant of oceanic health, it was a shock to see the evidence that is now before us. 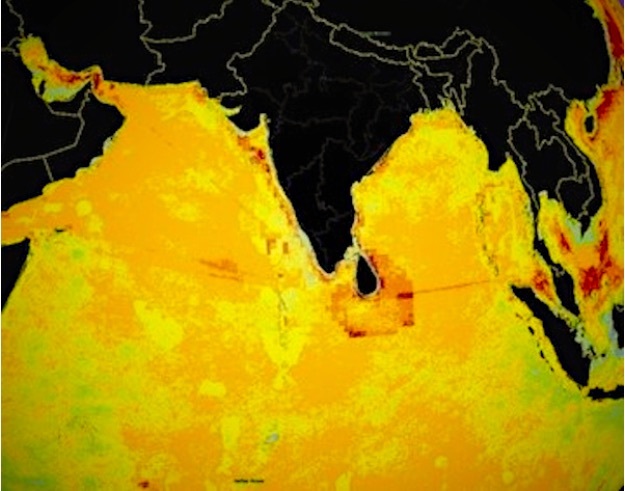 The map of the Indian Ocean shows an ugly halo of pollution and ocean impact that rings the ocean around Sri Lanka. The irresponsible use of our land, cutting the forests, eroding the soil and drenching it with artificial fertilizers and agro/ industrial toxins, finally result in polluting the ocean. The biological indicators of a healthy shoreline are the rock pools, once the rock pools that fringed our shores were alive with fishes and even corals, all the rock pool corals were lost by the 80’s. The inshore corals and the fringing shallow reef was next and finally the deep reef. We saw this national patrimony degrade and disappear within our lifetime. Those who have experienced the biodiversity of the Welawatte canal, before the advent of the textile mills pumping their affluent into it, will know the changes. It was a time when coral reef fish such as Butterfly Fish (Cheatodons ) could be seen under the road bridge at Welawatte. The toxic affluent changed the clear waters to a dark, opaque hue and destroyed all the things that lived in and along the canal. Even at that time, many of us realized the damage that was being done to our inland waters by irresponsible industrialists, predictably the politicians and bureaucrats ignored public concern, but the extent of the damage to the ocean around us was not even remotely realized until the advent of satellite sensing. A study of the satellite data also indicates that a major source of marine pollution comes from the shipping that goes through our waters, polluting without any care, what will happen, when the dirty, bunker fuel burning, cheap freighters begin to call in at Hambantota? Now we are being told that huge areas of land in the South of Sri Lanka are being offered to industrialists to invest in projects of their choice. In a global reality where polluting and toxic industries are being forced out of responsible nations, are we surprised that they will seek, poor and desperate countries with weak environmental safeguards and corrupt guardians, to invest in? FDI should be a process that we could welcome if the investors are concerned with maintaining the quality of life enjoyed by the population of the host country. FDI could contribute greatly to achieving the Sustainable Development goals that the nation has ascribed to. But to allow FDI that brings in irresponsible industrialists, who profit from environment degrading processes, must be seen as a traitorous act that betrays our nation. We do not want to wind up like the poor butterfly fish of the Welawatte Canal. It is in this context that we should look at our watchdogs, responsible for protecting our environmental security, the Central Environmental Authority. The current plethora of Environmental Assessment Impact reports that have been approved by them is appalling. The Port City, The Hambantota fiascoes, The Uma Oya project are just a few examples where they have failed miserably to protect the wellbeing of this nation. Approvals have been given on extremely questionable reports. One wonders if there are any professional Ecologists in this institution? From the nature of their evaluations I will venture to guess that they do not have one. To have poorly trained individuals in charge of environmental protection dancing to the tune of politicians and ‘investors’ is dangerous for the future. The question now is ‘What can we do ?’ A public demonstration was held in Bandarawela last week to protest the irresponsibility of the Government officials responsible for the Uma Oya project, which was destroying the shallow aquifer, robbing all the wells of their water and cracking the foundations of dwellings and commercial buildings. There, the level of irresponsibility by the Government was publicly exposed. The Uma Oya project began almost a year before an EIA was issued and approved. In the face of this illegality, some officials are still attempting to force the project to proceed. It is now a question of a person protecting his or her property. If a group of foreigners are engaged in an illegal activity that threatens the sustainability of an entire region of a nation, whom will the government protect? The Nature of the underlying rock formations in respect to the shallow aquifer has not even been considered in this EIA. The threat of landslides already a concern in the area, could be greatly increased if the tunneling is allowed to proceed. It is said that actions speak louder than words, many words to placate the people of the Uva have been spoken but houses continue to split, wells continue to dry. Community protest against the Uma Oya project. As the affected people stated, they need their disrupted lives settled urgently, but how do we pay compensation for a drinking water well that provided water for ten generations or more? What compensation can be paid for weakening the rock structure of the Southern mountains and exposing us all to landslides? And finally, who is this water for anyway? If these perverted process are termed ‘development’ then we have truly lost our direction. Egotistical bombast is not leadership. Compromising our environmental and public health for ‘investments’ can never create a bright future for us or our children. Ranil – Keep up the good work of informing those of us who are privy to your warnings about the extreme myopic (non) policies of our successive administrations, who are more concerned with the commissions they can make than what is best for the country. Letting the Chinese come over and pollute our lands and waters is accelerating an already dangerous imbalance in our island-ecology. This is not to mention the jobs they will take from our unemployed citizens and the wildlife they will consume (those Chinese that came over to the South under the Rajapakse regime have already eaten most of the small mammals, reptiles and amphibians in those areas!). We have to pity our succeeding generations who will face the disasters that our current lot of crooked politicians are preparing for them! The main culprits of environmental degradation are the Developed Countries, India, China and USA. Our contribution is miniscule. We have a choice to stay as a poverty stricken nation or to develop. You can have the Beard or the Porridge, cant have both. Hambantota development can be done in a sustainable manner. Japan is a good example where 30% of land is reserved for greening by industries like Toyota. Development in the area is neccesary to make use of the port and airport. This type of blind opposition to development is driven by bankrupt politicians. He simply ignores the fact that, as Ranil points out, ” Sri Lanka is exposed as the worst polluter of the Indian Ocean. The new maps on human impact on the world’s oceans are now on the web”. His final assertion that “This type of blind opposition to development is driven by bankrupt politicians “, is another gem! It isn’t the “bankrupt politicians” that oppose this type of so-called development, it is the concerned citizens, scientists, ecologists and folk with some commonsense based on undeniable facts (Global Warming is real), that oppose the degradation of our country for short-term ‘goals’. The “bankrupt politicians ” are the ones who promote unsustainable ‘development’, like selling our country to the Chinese and anyone else who will pay the commissions that those bankrupt entities thrive on! The “blindness” is on the part of those like B. Makka (a dog’s flea?) who can’t see the forest for the trees! My comment is about Industrial Pollution where Sri Lanka being a non-Industrialised country is very low compared to heavily industrialised India etc. This concerns the carbon footprint, air pollution etc. You need to be clear about what you are talking about. Marine pollution is caused by the Ships that sail past south of Sri Lanka as stated by Ranil – A study of the satellite data also indicates that a major source of marine pollution comes from the shipping that goes through our waters, polluting without any care …. 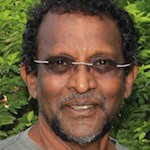 His concern is regarding ships entering the port of Hambantota. Can you have a port without ships? Then we should have no ports and grow our own food etc. which is not the case. New technologies are available to reduce pollution by Industries. Similiarly Marine pollution can be controlled by imposing stiff penalties for violators etc. Staying a backward country and blaming people is not an option. Tripper go for a Trip to Japan and see how they manage the environment being a highly industrialised country. 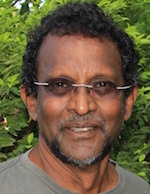 B Makka – I’m sure Ranil could explain better than I could about the ‘industrial’ pollution that contaminates the ocean surrounding our Island. “The irresponsible use of our land, cutting the forests, eroding the soil and drenching it with artificial fertilizers and agro/ industrial toxins, finally result in polluting the ocean.” sorry doesnt make much sense, highly exaggerated. Needs to backup with figures and data. How much ppm of agro industrial toxins and fertilzer in the ocean? Why I mentioned Japan is because of the common Buddhist culture of respect for the Environment.So Japan can be a good role model for Sri Lanka. It is also technologically advanced in Pollution control. Japan is highly industrialised and therefore consumes a lot of fuel and emits the products of combustion. However Japan is a good example of regulation and compliance to environmental standards.Below exerpts from Ministry of Environment in Japan. In Japan, the Basic Environment Law, which set out basic principles and directions for formulating environmental policies, was enacted in November 1993. In December of the same year, the “National Action Plan for Agenda 21” was submitted to the United Nations. In December 1994, an action plan called “the Basic Environment Plan” is adopted. It was the most important measure introduced under the Basic Environment Law. The plan systematically clarifies the measures to be taken by the national and local governments, as well as actions to be carried out by citizens, businesses and private organizations by the beginning of the 21st century. It also defines the roles of parties involved and the ways and means for effectively pursuing environmental policies.. Moreover, the Environment Agency is proactively implementing supportive measures, including one measure to support the UNEP International Environment Technology Center as a core organization for appropriately transferring technology to enrich and reinforce the ODA system to realize sustainable development in developing countries..
Japan is particularly interested in the Asia-Pacific region because of its proximity to Japan. Countries in the region have been confronted with various problems because of population growth, poverty, accelerated consumption of resources and energy due to lifestyle changes, deterioration of urban environment, etc. To help overcome these problems, the Environment Agency is striving to preserve the regional environmental integrity and promote intra-regional cooperation through dialogues on environmental policies at the Environment Congress for Asia and the Pacific (Eco-Asia)..
What I mean is Pollution results from all human activity. The clothes we wear, the food we eat, the vehicles we travel in, the houses we live in are all products of Industry and Processes which invariably pollute the evironment. So the solution is to control and mitigate not to simply criticise and condemn. Pollution low in Sri Lanka ? 90% of all the watersheds that once had drinking water are now polluted. The water in the sea around us is polluted by the toxic agriculture we practice and the erosion through poor agricultural or ‘development’ practices . The air quality of our cities have degraded to become a health issue today, but it is true that we are not being polluted to the level of the cities of China or India. Is this what we are attempting to do by allowing dirty bunker fuel burning ships closer to our shores or by giving out 15,000 acres of this nation to toxic, polluting industries who are being forced out of their countries to ‘invest’ in bankrupt or corrupt ones ? Any move to poison our nation and the future generations for profit, must be seen as traitorous. All these different types of pollution mentioned by you are a result of human activity within the shores of Sri Lanka. These are not due to Bunker fuel burning ships in the sea. Sea is polluted anyway although toxic agricultural waste may constitute only a miniscule of ppm. Water pollution can be controlled by strict standards and regulation. People too have to be educated not to pollute. Factories have to inspected and fined for polluting etc. Pollution of air is mainly due to the use of vehicles and industries burning fuel. These have to be controlled by strict standards and regulations. All countries are handling these problems. Going back to the stone age is not an option. Can you try to explain the actions of our beloved president Maithripala Sirisena. Uma oya,Wilpattu,Port City,Megapolis,Harbour city,15000 Acres to Chinese in Hambantota,Steel Houses in North East………the list goes on and on…….why????….. The whole trouble with us is: “We do not know how rich we are and always think we are poor”. This was the opinion expressed by Mr. Kirthi Dharmakeerthi, the ex Chairman of “Jathika Sampath Committee” participating in a TV programme titled “Pathikada” aired on Friday. It can be viewed and listen to him through social media. That explanation will boil the blood of any true patriot who strive to resurrect this country from the “Traitors” who work in close company with our Political Leaders. Mr. Dharmakeerthi was “forced” ,due to large number of telephone callers request to divulge the name of at least one such person and I offer my thanks and gratitude the hosting lady of that programme. Please view it and listen to this programme named “Pathikada” of last Friday. This article is also another good wake up call to our people who have been DUPED so far by these Traitorous Politicians and get awakened to the urgent call to secure this country for now and for the future. These are good moves by the “Intellect Patriots” and some more and more from all other walks of life must come forward. Yet those in front line are not equipped with the required know how. This was evidenced at the meeting the Prime Minister had in Hambantota with those who were protesting the land allocation. The PM came out with some glaring lies telling those questioned, that all those “Concerns” are taken care of in the “Agreement with the Chinese Company”. There was not a SINGLE to ask the PM to PUBLICIZE and bring it to the Parliament that so called “Agreement” and let the country KNOW what it contains and WHAT the COMMITMENTS and CONSEQUENCES are. At this meeting the PM entrusted the determination of particular land to be vested with the Chinese in the hands of MP Chamal Rajapakse and Sagala Ratnayake. Is that a way to make decisions and work out “National Planning” and again strangely NO ONE dared to question that aspect. 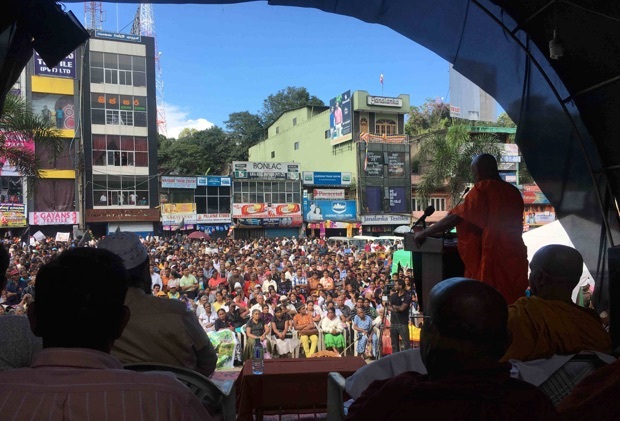 This meeting was held at a Temple and largely attended by the Buddhist clergy and laymen. Incidentally the PM was conducted to this meeting at the temple by MP Chamal Rajapake and he was very “silent”. What does that mean? Anyway, this could be the BEGINNING of some AWARENESS and it must now be carried forward with vigor and enthusiasm so that National matters can be handled in a responsible and transparent manner and not at the whim and fancy of these “Political Animals”. Another question: Where is the OFFICIAL OPPOSITION on these matters of NATIONAL IMPORTANCE? Are they THERE, where they SHOULD BE?